INDEPENDENCE, OHIO (February 19, 2019) – Kichler Lighting LLC, a leader in innovative lighting and ceiling fans, introduces new fixture families to support builders with the quality and performance they rely on and address the design preferences of consumers. The New Street collections include lighting options designed to create high impact with stylish, statement-making chandeliers. Brought together with coordinating finishes such as Black and Natural Brass, this introduction makes mixing-and-matching fixtures and styles easier than ever. Warm and welcoming tones give Marimount™ a rustic feel. The wood-appearance structure offers weathered style in a rich Auburn finish, framed in Black metal. Removeable clear glass shades complete this design with a customizable option. 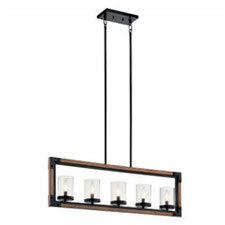 Marimount is available in a pendant, four-light foyer pendant, and five-light linear chandelier. Two on-trend finishes deliver sleek industrial-era style with Piston. Natural Brass accents add the shine, while the Black mesh cage forms the structure. This collection is available as a six-light chandelier, four-light oval chandelier, six-light foyer pendant, and mini pendant. Since 2010, professional builders have continued to name Kichler the No. 1 decorative fixture brand in terms of quality and recommend more than any other competitive option. The 2019 New Street line reinforces Kichler Lighting as a leader in design with lighting options that deliver exceptional style and performance for interior and exterior applications. All products in the line come with a limited warranty. To view the collections firsthand, visit the Kichler Lighting booth #N1763 at The International Builders’ Show. For more information, and to locate your nearest distributor, please visit kichler.com. Kichler Lighting LLC strives to transform the home and workspace by developing fixtures that perform efficiently, install intuitively and deliver an overall effect that combines style with purpose. With an extensive portfolio of more than 3,000 on-trend products – including lighting, landscape and ceiling fans – and a commitment to providing services and project solutions, Kichler® is the brand homeowners and professionals know and trust since 1938. Kichler Lighting products are available at independent showrooms, Lowe’s, electrical and landscape distributors and online. For more information, visit www.kichler.com. Houzz® is a registered trademark of Houzz, Inc.
Instagram® is a registered trademark of Facebook, Inc.